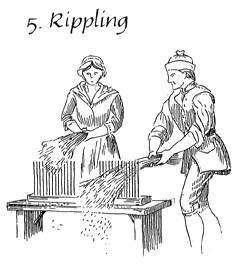 See the steps involved in making linen from flax. The Ballard household was a nest of economic enterprise. Everyone worked. Ephraim surveyed, drew his maps, wrote his survey reports, met clients, collected taxes, farmed, and cut wood for the household. Martha grew and prepared herbs and simples, practiced midwifery, treated the ill, knitted, made and mended much of the family's clothing, and attended to her housework. The boys farmed, cut wood and timber, and helped at the mills. When the girls were old enough, Martha brought in a loom for weaving, and the family launched into textile production. Weaving had evolved from a full-time men's occupation to part-time women's work. 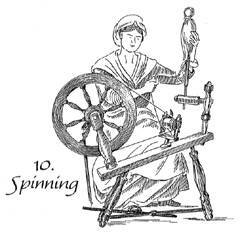 Not all women wove nor did all women spin. Instead, community networks of women bought and traded fibers, labor, skills, and finished goods to acquire cloth for their families' clothing. Neighbor women taught the Ballard girls to weave . Women with looms borrowed and loaned equipment, such as the parts of looms called slays. In Martha's diary we see many such daily exchanges. The women in the Ballard household produced textiles during the years before the girls married. They grew and harvested flax. The family's sheep gave wool. All the women in the household spun and prepared yarn and thread for weaving. The girls learned to weave. Weaving gave the girls a useful skill and also contributed to the household income. Martha did not weave, but the girls wove while Martha was off practicing her midwifery. Sometimes they bought cloth and thread, and they bought raw cotton by the pound. The Ballards had worked out an efficient system. Yet the beginnings of mechanization foretold changes. As we know, mechanization would eclipse household textile production within the next generation. Both the film A Midwife's Tale and chapter two of the book A Midwife's Tale deal with textile production. Clear. the Girls went to School afternn. mr Ballard ploughd flax in. I Brued. Danniel BroT a Salmon, wt 21-1/2 lb. we BoT 61 lb of pork. Saml Foster & Wm Pullin Dind here. mr Balld Bot him Self a pair of hoes at mr Westons. Clear & warm. mr Ballard planted Corn. Dolly & Hannah Cool Dropt aftern. old mr Wheeler & mrs Taylor here. Cyrus Brot the bars and other utencils for weaving home. he had Some Veal of mr Allin & 2 lb Butter of Br Patingl. Clear. the Girls Strikeing harnis. I went to See mrs Williams. mrs Voce & Betsy here. mr Smyle Sleeps here. mr Ballard surveying for Revd mr Foster & been to Doct Coneys. mrs Harris, Lidia Bisbee, Sally Peirce & others here ys Evinng. mr Savage made the irons for our Loome. I paid him 4 Shillings in Cash. Clear. we warpt a webb of 42 yds Linnin. I went to mr Williamss, his wife is better. mrs Pollard here at Evinng. mr Hodges Came there Last Evinng. Revd mr Foster here aftern. mr Ballard been fixing the loome. rainy fore noon. Dorkis Pollard here to warp a piece. mr Ballard fixing the loom. Hannah Coll Sett the webb to work. mrs Voce here, says mrs Pattin is very unwell. Jonathan Brot home 9 lb of hard Bread which Cost /5 pr lb. Clear. I planted pepers, anis & coriander. mr Rich from the westward workt here, Jonn afternn. Polly Bisbee here. I combd 7-1/2 lb of flax for myself &  1/2 for Cyrus. Clear. I am more Comfortable than I was yesterday. mr Ballard Brot our Kittle from Savages. mr Edy asistided him. we Boild a Linning warp, 55 Skeins. the girls gon to mr Crags. mr Howard Left here ys morn. Clear. I quilld 7 Skeins of yarn. Cyrus Bot 2 lb of Butter. mr Ballard Brot home 14 lb Cod fish. Son Town Slept here last night. I went to mr Westons, Bot a XXXVI Slay. Son Town here.